A classic indo-chinese noodles recipe often made during parties or occasions. 1. Heat 3 to 4 tblsp of oil in a pan over medium flame. 2. Add the mixed vegetables, bean sprouts and spring onions. 4. Mix the cornflour with 1/2 cup of chicken stock until fully dissolved. 5. Add to the pan. 6. Add the chicken stock, soy sauce, chilli sauce, tomato sauce, ajinomoto and salt. 8. Add the chicken pieces and cook for a few minutes or until all moisture has absorbed/evaporated. 9. Transfer the noodles to a large bowl. 10. Pour the chicken mixture on top. 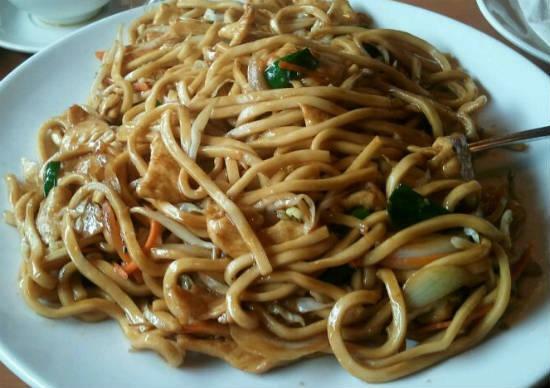 Feel free to comment or share your thoughts on this Chicken Chow Mein Recipe from Awesome Cuisine.